The design of probes sent to Mars over the years hasn't deviated much from the standard rover we all know and love - most recently in the form of Curiosity. There have been a few attempts to mix up the familiar, most notably in the form of the failed Beagle 2 project, but none have ever truly pushed beyond a conventionally safe means of exploration. The risks of designs similar to planes, helicopters and hot air balloons have simply appeared too risky. But now, a UK team is developing a robot that can bounce across the surface of the Red Planet. The group from Leicester University wanted to address the problem of terrain difficulties encountered on Mars. Curiosity's route to its next scientific stop along the Martian surface specifically avoids a dangerous sand trap between it and its destination. The main issue of propellant supply is addressed by theorizing that such a robot could extract carbon dioxide from the planet's atmosphere before being compressed and liquefied. It would then be pumped into a chamber and exposed to an intense heat from a radioactive source on board. The CO2 would ignite and generate thrust through directional nozzles. Calculations over the course of development suggest the one tonne craft could leap a distance of 900m at a time. "The advantage of this approach is that you have the ability to traverse more aggressive terrains but also that you have wider mobility - the possibility of traversing much greater distances than we have with even the very successful rovers," says Hugo Williams, from Leicester's Space Research Centre. The biggest problem facing the robot is the hopper's legs. 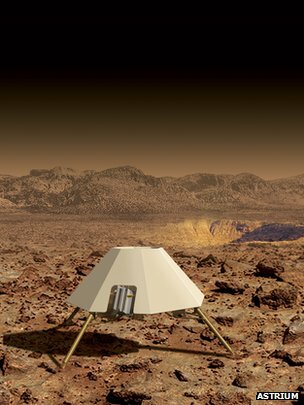 Designs used in previous Mars projects have only been required to function once on landing. They have thus been a collapsible honeycomb lattice that absorbed some of the impact before becoming crushed and useless after reaching the surface. The hopper would require reusable legs that can be reset after taking the impact of each successive landing. Ideas used here on Earth would carry too much risk, such as designs that rely on hydraulic fluid. The team instead has turned to magnetism to solve this dilemma. "When you drop a magnet down a copper tube, you expect it to fall under gravity but it falls very slowly because, as the magnet drops, it creates eddy currents that generate an opposing magnetic field," explains Mike Williams, a mission systems engineer at the European Aeronautic Defence and Space Company (EADS). He goes on to say that; "Our legs would use this approach - a very simple, elegant solution that produces a damping effect. Nothing is crushed, and there are no fluids, which means we would be very insensitive to the environment and cold temperatures." The project still has kinks to be ironed out, such as the system that collects CO2 currently taking several weeks to produce enough usable propellant for a jump. To be an efficient method of transport compared to past endeavors, the process needs to be shortened considerably. On top of that, static probes and mobile rovers have been doing a fantastic job of supplying data for analysis back on Earth. It's the question of whether conventionally inaccessible areas on Mars have enough scientific interest that will determine if this project truly gets off the ground.